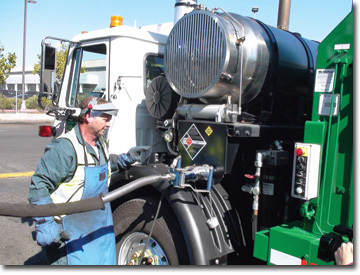 Thanks to a new landfill waste-to-energy project in California, the natural gas powering garbage trucks is produced from the garbage those same trucks haul to the landfill. The $15.5 million facility in Livermore, California, is designed to collect landfill gas and convert it to 13,000 gallons of fuel grade liquefied natural gas per day. While solar and wind power projects often grab the big alternative energy news headlines, developers of landfill gas-to-energy (LFGTE) projects in the U.S. have quietly gone about their business expanding capacity, largely unnoticed-a bit like the garbage truck that predictably shows up every week to cart away the trash. LFGTE projects take advantage of the gas released by organic decomposition at landfill sites. A considerable amount of gas is already collected and flared at large landfill sites to comply with management regulations. However, some landfill operators have recognized the value of this gas resource as a fuel to generate power or to purify into products like liquefied natural gas (LNG). Waste Management Inc., North America's largest waste management company, has been an industry leader in the development and commercialization of this alternative energy technology. The company believes that there is considerable growth potential in North America's LFGTE sector. That's because Americans throw away about 4.7 pounds of garbage per person per day, which adds up to 254 million tons of waste per year. The U.S. Environmental Protection Agency (EPA) says that at the end of 2008, there were some 480 operational LFGTE programs in the U.S. Waste Management alone operates 100 LFGTE projects at its landfill sites and plans to develop another 60 by 2013. By then, the company says it will produce enough landfill gas to generate 700 MWs of energy, or the equivalent of enough power for 700,000 homes. Its overall goal is to double its power generation capabilities from waste-based energy by 2020, which would be the equivalent of providing power to two million homes. "While the development and use of LFGTE technology may not be the only path to energy independence, it's certainly something to consider, and it's a piece of the sustainable energy puzzle that leaders in the waste management industry are finding impossible to overlook," says Wes Muir, Director of Communications at Waste Management Inc. The most recent entry in this green energy sector is the world's largest LFGTE project located at Waste Management's Altamont Landfill and Resource Recovery Facility in Livermore, California. The $15.5 million facility is designed to collect landfill gas and convert it to 13,000 gallons of fuel grade LNG per day. Interestingly, that fuel will be used to power 300 of Waste Management's 485 LNG waste and recycling trucks that serve 20 California communities. The plant has been operational since September. It is the largest plant in the world by quite a distance, with the next largest plant in the United Kingdom capable of producing 10,000 gallons of LNG per day. 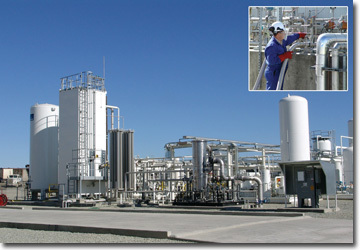 There is also another LFG-to-LNG plant in southern California that produces 5,000 gallons per day. The LFG-to-LNG project at Altamont is a partnership between Waste Management and Linde North America, one of the world's largest gas and engineering companies. Waste Management is responsible for managing the landfill and the gas collection system to ensure that there is an adequate amount of gas to supply the LNG liquefaction and purification plant, operated by Linde. This is the first time they have partnered in a joint venture, and now that the Altamont facility has been commissioned, they are investigating a number of additional partnerships as Waste Management rolls out its expansion program. Besides being the largest LFG-to-LNG site in the world, development of the Altamont site has also helped to advance landfill gas purification and liquefaction technologies, according to Steve Eckhardt, who heads up business development for alternative energy at Linde North America. "The biggest advance was figuring out how to do this cost effectively- scaling down the liquefaction technology," he says. "LNG plants around the world today are typically 10, 20, or even 100 times larger than what we are employing at this landfill, so developing a liquefaction system that could be applied to very small plants was critical." He says that good engineering and design were key to keeping costs as low as possible to construct an efficient plant. "On the purification side, I think the big breakthrough was taking processes and known technologies and putting them into a new application," says Eckhardt. "Most of these technologies have not seen application in landfill gas." The Altamont site was a prime target for an LFG-to-LNG project. Waste Management actually worked on developing the project for about eight years, even before Linde arrived on the scene. The company was already operating most of its trucks in that area of California with commercial LNG, so developing an alternate source of fuel from its own landfill site made the project highly attractive. The main difference between commercial LNG and LNG recovered from landfill gas is that the LNG manufactured from landfill gas is coming from a renewable resource, as long as people keep throwing organics into landfills. "The project puts refuse trucks on fuel that is created by the garbage that they take to the landfill," says Eckhardt. "It closes the loop." Muir adds that so much landfill gas is collected at the site that Waste Management intends to continue to use a portion of the gas as fuel to generate power through a project managed by its Renewable Energy division. It has been operating a commercial power generating facility at the site for over two decades. In fact, the company has become so competent at designing, building, and operating landfill gas-to-electricity projects that it now offers this service to other private and public landfill operators, including marketing of the power generated. 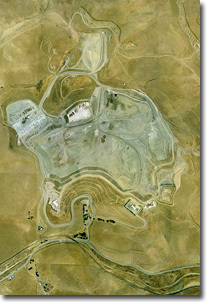 An aerial view of Waste Management's Altamont Landfill and Resource Recovery Facility in Livermore, California. The environmental benefits of the Altamont LNG project are twofold. From this large landfill, methane and other greenhouse gases, which normally would be flared into the atmosphere, are captured and turned into a value-added product. It also offsets the need to burn a non-renewable, conventional fuel in a large fleet of garbage trucks that are on the road a lot. The U.S. Department of Energy estimates that the biogas currently available in the U.S. could power up to 90 million light duty, gasoline powered vehicles. Eckhardt describes the Altamont landfill gas purification and liquefaction system as a multi-step process involving absorption in membranes, compression, and chilling. "Each step takes out certain contaminants," says Eckhardt. "We have designed a system to eliminate all the contaminants before the gas goes into the liquefier." He says once the biogas is in the liquefier, it proceeds through a heat exchanger. The warm biogas flows against a mixed refrigerant stream, which has the effect of cooling the warm biogas to minus 260 degrees Fahrenheit, turning it into LNG. The LNG is collected in large storage tanks, which resemble giant thermos bottles. A tractor trailer unit then collects the LNG and transports it to Waste Management refuse truck refueling stations throughout California. Linde brought its experience in both gas purification and liquefaction to the partnership. "We were familiar with the types of purification steps needed on this project from other parts of our business related to purifying other gas streams," says Eckhardt. "The idea was to effectively use that know-how to reduce the risk and increase the level of success when we actually commissioned the plant." That strategy has borne itself out, he adds, given the relatively short time it took to commission the purification and liquefaction plant at the Altamont site. From initial design to commissioning, Eckhardt says it was a 12 to 18 month process. He emphasizes that this is not a test facility-it is intended to perform as a commercial scale plant designed to operate for many years. However, the knowledge acquired from the Altamont project will be used to construct more cost-competitive plants in the future. At a time when climate change remains a big public concern, such projects deliver environmental benefits. "The Altamont LFG-to-LNG facility enables us to recover and utilize a valuable source of clean energy in another practical way, reducing our dependence on fossil fuels," says Duane Woods, senior vice-president for Waste Management's Western Group, "The ability to use recovered landfill gas to fuel our fleet offers significant environmental benefits to the communities we serve in California and is a great example of how we are committed to recovering resources in the waste." California is noted as a global leader in advancing environmental initiatives and this project is a good example of that. It will help California Governor Arnold Schwarzenegger advance two of his key environmental directives: the Bioenergy Action Plan, which seeks to advance the market development and use of biomass as a transportation fuel, and achieving the goal of reducing the state's greenhouse gas emissions 25 percent by 2020. The state put its money where its mouth is, so to speak. It provided considerable financial support for this project through the South Coast Air Quality Management District, the California Air Resources Board (CARB), the California Energy Commission, and the California Integrated Waste Management Board.